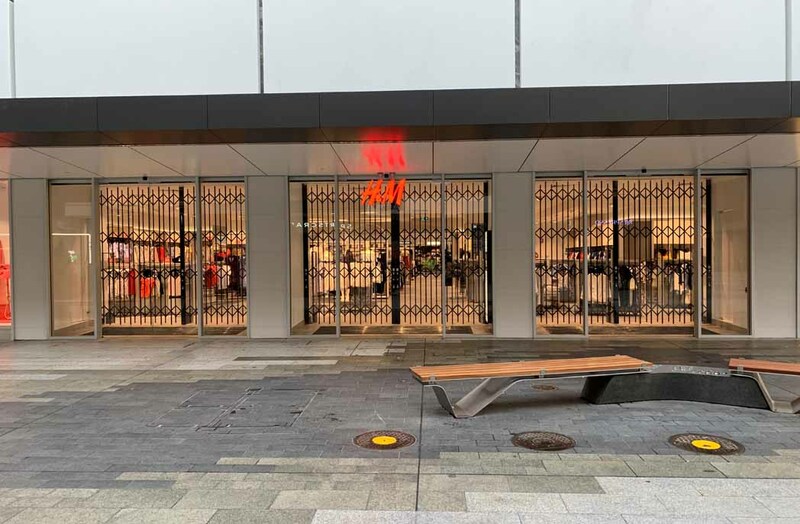 Global retailer H&M has recently installed world-class security shutters to secure their new storefront at Adelaide’s Rundle Mall. H&M is one of the world’s foremost fashion groups and employs more than 161,000 staff in more than 4400 stores in 65 countries. The Australian Trellis Doors Co. (ATDC) installed its stylish retractable security shutters (in a night sky powder coated finish) across three adjacent shopfront windows. By configuring these doors on a side-by-side parallel set of top tracks, ATDC was able to install these doors in a way that they all overlapped each other and folded back to a common storage bay, significantly reducing the required overall stacking requirements for these shutters. This was made achievable through the use of multiple up/down locking mechanisms which created a seamless lock up situation. Further technical information on ATDC’s unique parallel top track configuration, go to ATDC’s website. The project manager for this job was Streetbuild Constructions. For further information on ATDC’s full range of commercial security shutters, contact the company toll-free from anywhere in Australia on 1800657435 or visit the website.